To create more dynamic, aesthetic, fun and natural looking trees while respecting the Minecraft graphic stylization and enforcing a narrow project scope that keeps things simple. A growing tree is a multi-block structure of rooty soil, branches, and leaves blocks that has many advances over the Vanilla Minecraft tree structures. The formation of the tree starts with a seed. This seed is either planted by hand much like a Vanilla sapling or the seed has a chance of planting itself if left on the ground in a suitable location. The tree then grows from a sapling, slowly increasing it's size over time, into a full sized tree. The tree can then be chopped down at it's base and all of the wood claimed at once. Grow progressively from seeds to mature trees over time. Won't grow in darkness. Leaves not connected to an outer tree branch or starved of light will die. Outer branches without leaves slowly rot away. Thin branches can be climbed like ladders. Comparator can be used to sense soil fertility level. Potion of Persistance[ ]: Stops tree from changing(Dynamic leaves are changed to Vanilla leaves). Completely depletes the soil. The tree will no longer grow, die in the dark, or drop seeds. Are randomly dropped from trees(rate is adjustable in config file). Crafted from a vanilla sapling and a dirt bucket. Can be used to create vanilla saplings by crafting with a dirt bucket. Worldgen can be disabled to allow Vanilla trees to still spawn and function normally. Cutting the tree at it's base will fell the entire tree. Fortune enchantments on axes are actually useful and work to increase log yield. Trees fall over when harvested(disable-able special animation effect). The woodland staff is a multi-function tool intended for use in creative mode(can't be crafted). In the most basic usage it can be used to copy a tree. Right click on any dynamic tree with the staff to pull it's JoCode. Next, right click on viable soil to recreate the same tree. The tree is also rotated based on the player direction. If the player right clicks a tree with the staff while sneaking then only the tree species will be copied, leaving the JoCode unchanged. In this way you can for instance create an acacia tree that is shaped like a tall jungle tree. Another feature for the Woodland Staff is that any JoCode pulled from a tree is also copied to the system clipboard as text. This enables a player to share tree models with others easily. No tile entity rendering is used. Rendering is done with BakedModels for better performance with large numbers of tree nodes. Leaves are only updated with updateTick() so chunks are re-rendered when dirty no more than with vanilla crops. A DropCreator interface is used for creating seed drops and other items. New drop creators can be registered by other mods to expand existing or new tree behavior. Growing leaves blocks use 4 species sub-blocks to a Block using metadata encoding for conserving BlockIDs. Worldgen uses a custom variation of Adaptive Incremental Stippling(AIS) using the PoissonDisk Distribution for high quality and non-overlapping tree placement. Seasons. In autumn the trees turn fall colors, in winter leaves fall off completely and regrow in spring. Plans are in the works for the serene seasons mod. Features like these will never be implemented. I'm not suggesting that these are bad ideas or wouldn't be fun but they are indeed outside the scope of what this project is meant to accomplish. Those wishing to implement out of scope features are welcome to do so in a separate expansion or compatibility mod. Popular mods tend to experience scope creep and featuritis. Ultimately you end up with jet packs, metal ore trees, nyan cats, flaming super death cactus swords, and 15 kinds of creepers. I won't have it. If you ignore this list and leave a comment asking for anything in the out of scope list you will be ignored. Have fun talking to yourself. 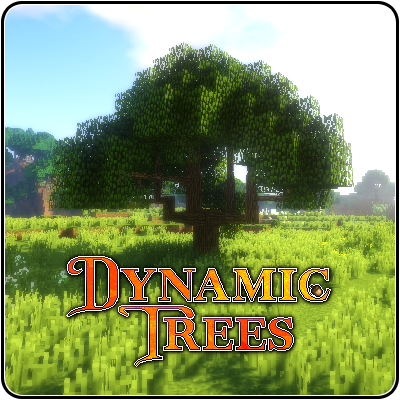 Q: Will you create Dynamic version of the trees in TFC, Forestry, Natura, etc.? A: I will not add this to the base Dynamic Trees mod. This will need to be achieved in an add-on like the one made for Biomes O' Plenty. I personally won't be making these add-ons so stop asking. Q: Will you add an option to make the world partially generate vanilla trees? A: No. I will not complicate the already complicated generation process. Having ultimate power to config all aspects of the mod makes my life more difficult because I need to evaluate and troubleshoot every possible edge case. Q: Will you backport to X minecraft version? A: No. Probably not. It's a waste of my time. Q: Will you implement feature X, change X, or make X optional in the config file? A: I don't know, maybe. Just don't take it personally when I say "no". I have to maintain this project and it's scope. The more complicated the features and options are the more difficult it is to troubleshoot problems. Better Beginnings: Can't chop down a tree with your bare hands, tools work as intended. Optifine: I know, right? Can you believe it? Quark: The grass color of the Rooty Dirt Block and the dynamic leaves foliage is changed by Quark's greener grass option. Passable Leaves: Dynamic Tree leaves become passable when this mod is installed. Tree Chopper: Tree Chopper interferes with the Dynamic Trees harvesting algorithm. The only workaround is to remove Tree Chopper at the moment. If you are only using Dynamic Trees for your trees then you don't need it anyway since you'll get the results you're looking for without it. I've put an issue on their github page but have not received a reply. Permission is hereby granted to use this mod in ANY mod pack or server. Please don't ask for permission to use the mod in your mod pack after I've already told you that you can, it's annoying. Attribution would be nice but I don't require it. You are not allowed to re-publish this mod to other sites without providing a CurseForge download link and my permission. Did I mention that you have permission to use this mod in your mod packs?.. Good! You were paying attention! See issue tracker on github. The comments section was removed because it was abused. Use the issues link at the top of the content section for reporting bugs.